It's that Christmas thing coming up soon. Whatever your opinion of the event there have been some original gift ideas over the past couple of years - all in the spirit of helping the planet. Last year here in Denmark, the rage was buying a goat for villages in Malawi. It was a storming success. So much so that there were too many goats for the selected villages so they had to bring other villages into the scheme to offload the creatures. Which is a good thing. Last Christmas Danes bought 16,413 goats, 15,017 flocks of hens and 131 cows for the third world, on behalf of friends and loved ones. This year in Denmark, UNICEF has a cool bike-related angle on their Danish website shop. 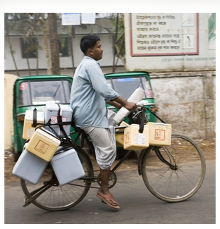 Amongst the other useful gifts for the needy around the world is the Vaccination Bicycle. What a brilliant idea. 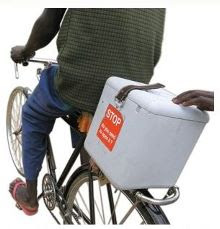 For a mere 300 Danish kroner [€40 / £27 / $60] you can buy a bike complete with a cooler box for transporting vaccines to outlying villages so that doctors can treat those who need treating. I don't know if UNICEF in other countries has the same offer, but check it out where you live if you like. ADDENDUM: Thanks to Tim K. for finding the corresponding link at UNICEF USA. "This is a great idea, holiday or not. Thanks for posting. I checked the US site -- it is available for $40"